We had a packed church for Easter Sunday at All Saints, Nathan and Natalie lit the Paschal Candle, and we worshipped and received the Eucharist together. 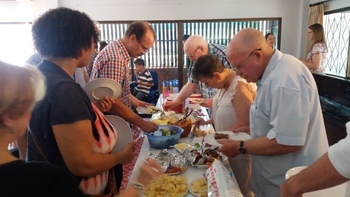 The service was followed by a great potluck, and we stayed cool indoors, despite the outside temperature reaching 40°C. 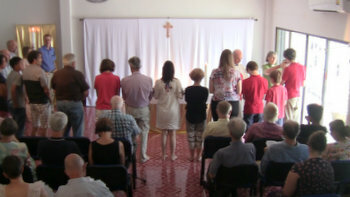 A video of the service can be seen via the Audio-Visual Page. 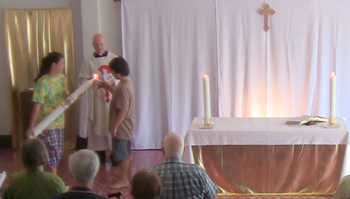 Lighting the Paschal Candle – it took two goes! Meanwhile, the missing sandals have been located and returned to their rightful owner! This coming Sunday we will continue our Easter theme, and our readings are Acts 5:27-32, Revelation 1:4-8, and John 20:19-31, and we will be singing the hymns Alleluia Sing to Jesus, All Hail the Power of Jesus’ Name, Christ is Alive, and Thine Be the Glory. The readings can be found via this link! Our Easter celebrations conclude tomorrow with our Easter Sunday Eucharist! 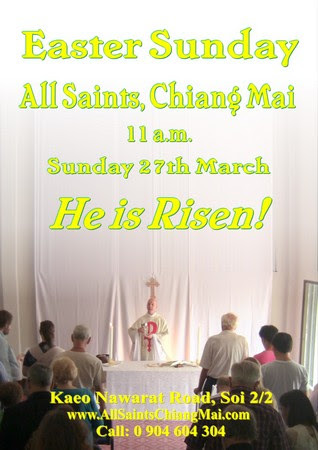 Come and join us as we worship our Risen Lord! This will be a joyous Eucharist to proclaim Christ’s resurrection and will be followed by an Easter Potluck Lunch and Easter Egg hunt! The Easter readings are Isaiah 65:17-25, Acts 10:34-43, and Luke 24:1-12, and we will be singing the hymns Jesus Christ is Risen Today, The Day of Resurrection, Christ is Alive, and Thine Be the Glory! The readings can be found via this link! Our Maundy Thursday Service will be a time for quiet, candle-lit, contemplation including Taizé chants and the washing of one another’s feet. The service begins at 7:30 p.m. and is a very peaceful preparation for Easter, We will end the evening by sharing bread and wine with one another. Our Easter services continue on Good Friday! 7:30 pm Thursday 24th March. This will be a time for quiet, candle-lit, contemplation including Taizé chants and the washing of one another’s feet. 11 a.m. Friday 25th March. Our service marking the crucifixion of our Lord. 11 a.m. Sunday 27th March. A joyous Eucharist to proclaim Christ’s resurrection. This will be followed by an Easter Potluck Lunch and Easter Egg hunt! This Sunday is Palm Sunday. 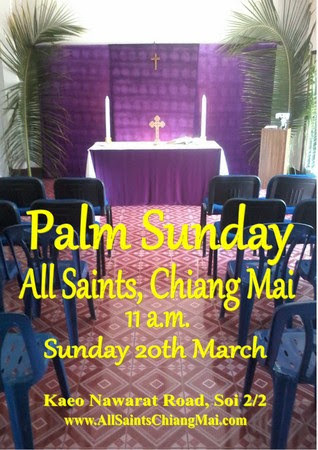 We will begin our worship with the parading of the palms, as we enter the church singing Hosanna and waving palm branches. It is good for us to remember that although Jesus entered Jerusalem to the cheers of the crowds, that popularity did not last. We all like to be liked, but sometimes we have to do what is right, especially in support of those who cannot protect themselves. I hope we can all remember this as we seek to live godly and useful lives of service to all! including Taizé chants and the washing of one another’s feet. 11 a.m. Friday 25th March. Marking the crucifixion of our Lord. 11 a.m. Sunday 27th March. A joyous Eucharist to proclaim Christ’s resurrection. This will be followed by an Easter Potluck Lunch and Easter Egg hunt! Harvey has also asked me to announce a concert which will take place next Wednesday, 23rd March. 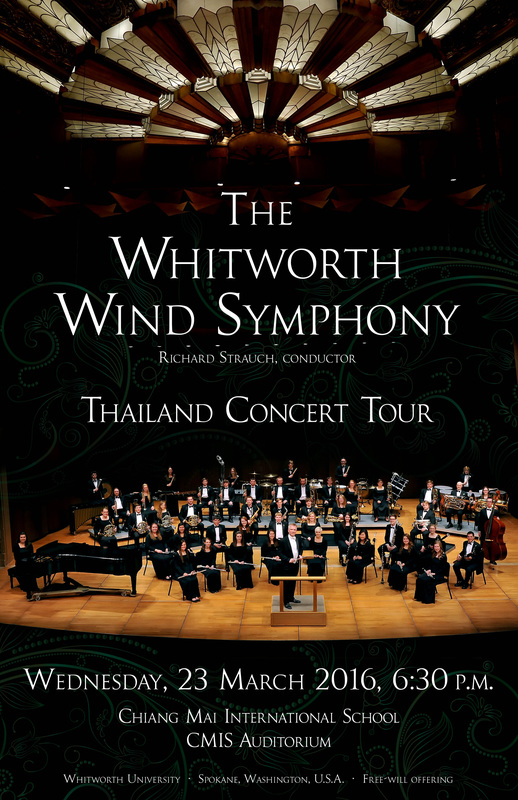 It is by the Whitworth Wind Symphony and will begin at 6:30 p.m. at Chiang Mai International School. It should be a good evening! The poster is attached below. The Palm Sunday readings will be Matthew 21:1-11 and Philippians 2:5-11, and we will be singing the hymns Hosanna Hosanna Hosanna in the Highest, All Glory Laud and Honour, Hosanna Loud Hosanna, You are the King of Glory, and Ride on Ride on in Majesty. The reading can be found via this link! 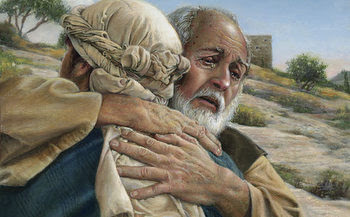 This week our Gospel reading is Jesus’ parable of the prodigal son, and this will be the focus of our sermon and worship. The parable is a beautiful illustration of God’s love and forgiveness – we all have much to be thankful for! This Saturday, 5th May, Lillian Wong, who attends All Saints with her husband Cary, will be performing in a special dance performance called Deliverance. The two shows will be at 1 p.m. and 3 p.m. at Chiang Mai University Arts Theater and are in aid of the School of Promise in Hang Dong. Then next Wednesday at 3 p.m., a Great Decisionsmeeting at All Saints will discuss the subject of migration. This is lead by All Saints regular, Gayle Avant. contemplation including Taizé chants and the washing of one another’s feet. 11 a.m. Good Friday Service marking the crucifixion of our Lord. 11 a.m. Easter Sunday – A joyous Eucharist to proclaim Christ’s resurrection. This Sunday’s readings are Joshua 5:9-12, 2 Corinthians 5:16-21, and Luke 15:1-32, and we will be singing the hymns The King of Love My Shepherd Is, What shall I do my God to love, For the Bread Which You Have Broken, and Go forth and tell! The readings can be found via this link! Nancy will be playing the organ at our 9:15 service, and Anders at our 11 a.m. service. Thanks to them both!